Solidly constructed of brass, this Orbit shrub head sprays in a half-circle pattern. Uniform in its watering coverage, this shrub sprinkler head is ideal for watering areas with shrubs, trees and flowers. It features 1/2-inch FNPT (Female National Pipe Thread) connection to easily attach to a riser. It adjusts water distance and flow with a twist of the top screw. This Orbit sprinkler replaces and works with many different brands of shrub head sprinklers. Whether this sprinkler head is used as a single unit for a small garden or shrub area or if it is connected to a garden sprinkling system, it is an excellent sprinkler that will last for years and provide dependable watering. Features and Benefits: Has 1/2-inch female threading, Sprays in a half-circle pattern, Constructed of heavy-duty brass, Distance and flow easily adjust with the top screw. 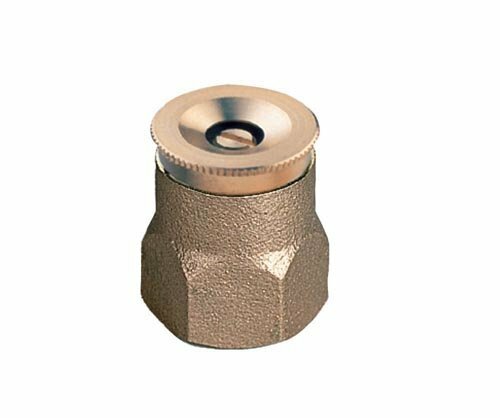 Irritrol 700-1 Ultra Flow Valve with Flow Control NPT Threaded, 1"